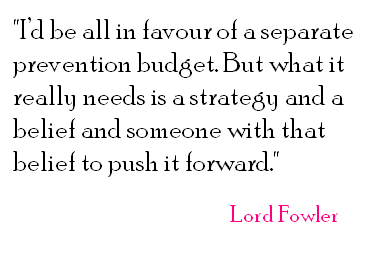 As part of a wider set of interviews carried out to reflect on the 65th anniversary of the NHS Sir Norman Fowler makes some points that may resonate with readers of this blog. far, far too little time and money is devoted to preventing ill health. It is still simply not taken remotely seriously enough. Much of my experience is with HIV at the moment and with the recent select committee we did point out that the Government was spending £760 million a year on drugs to treat people with HIV. I’ve got no complaint about that, but they spent £2.9 million a year on government publicity to prevent HIV. Actually they’ve now reduced even that. It does show something of the kind of priorities that we have. And I think that prevention needs to be given priority. I mean it’s all very well having a separate budget, and I’m all in favour of that, but what it really needs is to be given a lead, a strategy, a belief, because without that people are still not going to take it very seriously. And that goes way beyond HIV. It goes to all the things that people talk about – sugar, obesity, smoking, alcohol. You are going to be shot at if you go into that area. People are going to talk about the nanny state and all that. But that just has to be taken on. If you do these things one by one, it is highly dubious whether you really have an impact. I’d be all in favour of a separate prevention budget. But what it really needs is a strategy and a belief and someone with that belief to push it forward. The Labour MP, Seema Malhotra, asked the Department of Health about the spending on drug and alcohol prevention and treatment. The reply suggests that currently this data isn’t available (though we know that local authorities do already report their spending on young people’s substance misuse services), but that this may change. Each local authority is free to determine their actual spend on alcohol and drug prevention, treatment and recovery based on an assessment of need. They will be required to report their spending in these areas on an annual basis. What isn’t clear from the answer is whether the DH expect this to be broken down so that it is clearer how much (or little) is spent on prevention, treatment and recovery. Given the importance that many government policies place on preventative work and in the context of how the last Focal Point report found it impossible to identify prevention spending at a local level it seems to that it would be important that this distinction is made. How long before the government’s prevention fig leaves get blown away? Mentor has been quoted as part of a short debate on the Home Affairs Select Committee’s report on the government’s drug strategy. In terms of the wider debate there was a welcome focus on the role that prevention can play in reducing demand for drugs, but it is disappointing that all the Minister, Jeremy Browne, has to fall back on as concrete achievements of the drug strategy are the fig leaves of FRANK and the Choices Programme. The evidence suggests that the FRANK website is unlikely to change behaviour on its own. It may be that the helpline and other interactive services contribute to some preventative outcomes, but the Home Office have not (under successive government) undertaken or published any research on the behavioural impact of FRANK. Readers of this site will know that the EMCDDA recently recommended any mass media campaigns aimed at preventing drug use are accompanied by a robust evaluation. It is also worth noting that the budget for the services was been slashed to £500,000 last year suggesting that Ministers and officials don’t believe that it is an efficient way of spending money. Mentor’s collaboration with Addaction on the Street Talk project was the largest single beneficiary of the Choices programme, so while we can be clear what we were able to achieve with the funding we also know that this was a one-off fund which allowed us to deliver the project for less than six months. There has not been any suggestion from the Home Office that they will be continuing the programme. It is also disappointing to see the Minister’s response on school based prevention, where he takes the line that good health education is somehow divorced from other educational entitlements. Again readers of this site probably don’t need reminding of how interlinked risky behaviours and educational outcomes are. If you are interested in reading the whole debate it can be found here.